This is a manual for working with the DynaPort MM. It is recommended to follow the steps in this manual prior to the first measurement to familiarize yourself with the device and its settings. With the index on the left hand side of this page you can quickly navigate to the paragraph of interest. The manual for working with the USB DynaPort (Serial numbers UD2010xxxx and UD2012xxxx) can be found here. 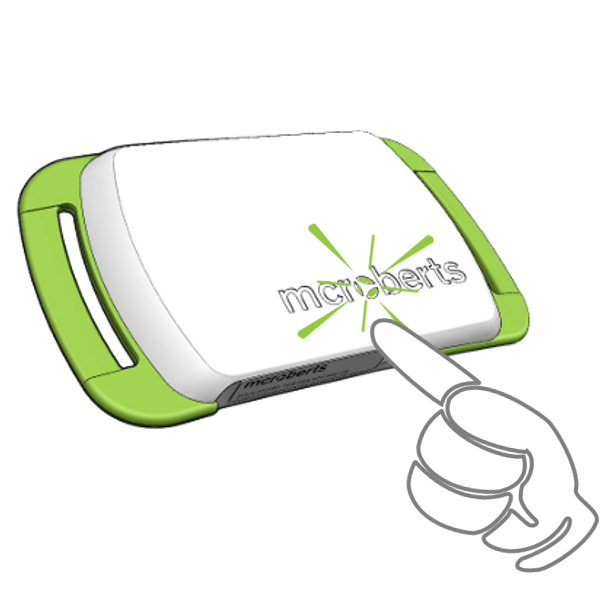 The DynaPort MM can be controlled via the website https://www.mcroberts.nl/mymcroberts. All steps, from preparing the measurement to viewing the reports take place here. After your first login a pop-up will appear with the request to download a small software package. Download this software in order to establish a connection between your DynaPort MM device(s) and the software on My McRoberts. Please follow the wizard to install the software. This needs to be done for each computer that you use the DynaPort MM on. It is important to charge the DynaPort MM to ensure maximal measurement capacity. If the battery runs empty during the measurement, the measurement will prematurely stop. The device can be charged by connecting it to a PC with the supplied USB cable. Multiple devices can be charged at once by using a powered USB-hub. Charging takes up to 5 hours. While the DynaPort MM is connected the LEDs give information about the charging status. Blinking green means that the device is currently charging and when the green LED burns constantly the device is fully charged. The DynaPort MM needs to be programmed in order to measure. 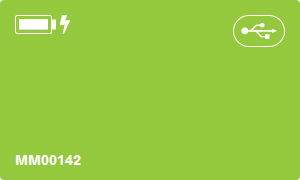 When you connect a DynaPort MM to your computer a green information tile will appear for each connected device in the Devices tab. The tile displays the device number (lower left corner), the battery status (upper left corner), and that it is connected via USB (upper right corner). Make sure to give Windows some time to recognize the device and install drivers, this will happen automatically. Only then can the DynaPort manager connect succesfully to any DynaPort devices. Select the starting time of the measurement; this can either be now or up to 7 days later. Thereafter, a measurement duration should be selected. The maximal measurement duration is 14 full days. 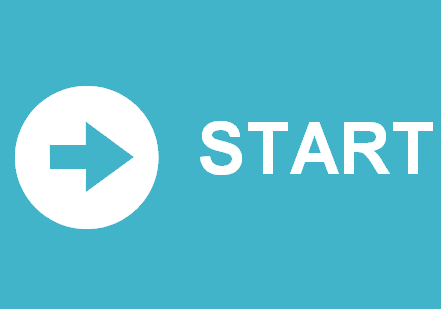 The device can be started with the Start measurement-button when all the necessary information for a new measurement has been supplied. The device can be disconnected from the computer when the program notifies you to do so. After disconnecting, the LEDs will blink for about 10 seconds after which the DynaPort MM will go into standby mode. When the selected start time is reached the DynaPort MM will start measuring. During the first 5 minutes of the measurement the green LED will blink. When data of a previous measurement is found on the device the program will ask to format the device prior to starting a new measurement. Note that formatting the device removes all data from the DynaPort MM. When the data from the previous measurement has already been uploaded to the MyMcRoberts web portal your data is save and removing it from the device is recommended. 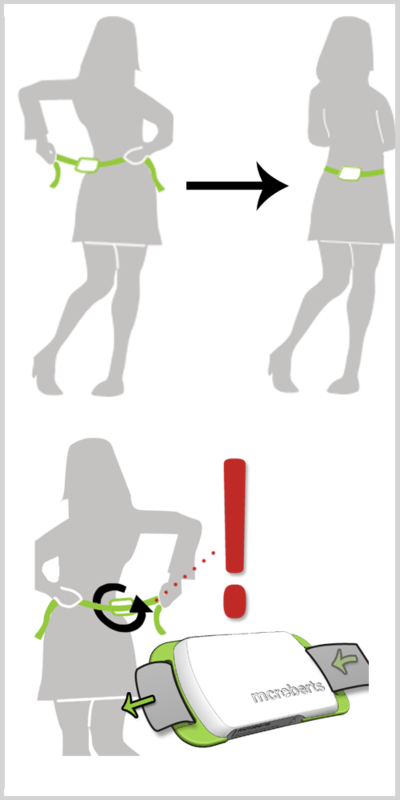 The device should be worn around the waist, at the middle of the lower back. The engraved McRoberts logo should be readable and the waist belt should be on the inside. It can be worn directly on the skin or over a thin layer of clothes. Please note that the DynaPort MM is not waterproof, so it is not suitable for showering, bathing or swimming. The collected data needs to be uploaded to McRoberts' online portal My McRoberts after measuring. After a succesful upload one or multiple reports of the measurement will be generated, depending on the amount of software modules you have purchased. 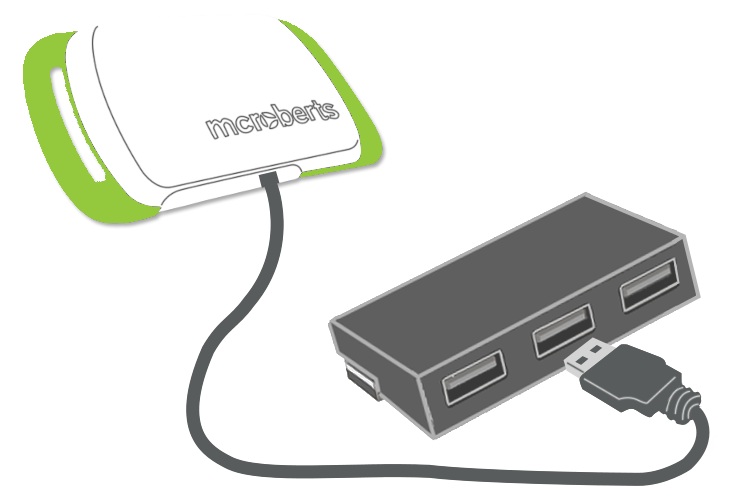 Log in to My McRoberts and attach the DynaPort MM to the computer with the USB cable. The data will be automatically downloaded from your device to your hard disk. Downloaded data will be uploaded to one of our cloud servers for analysis. A green information tile will appear that shows the processing status. All information about currently performing and performed measurements is visible in the tab 'Data'. Managing your data and viewing/downloading results takes place here. The following overview of measurement statuses is presented to you when you click the on 'overview' button on the left-hand side of the screen. This overview is shown by default when you click on the tab 'Data'. All measurements that are currently being performed are shown here. This overview shows the time left until a certain measurement has finished and it shows when a measurement is 'ready for upload'. 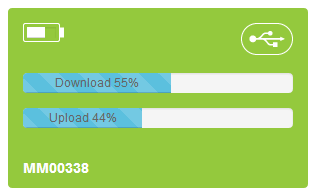 In that case you only have to couple your DynaPort MM to the PC to start the upload. Measurements that have just been uploaded are displayed under the 'Analysing' tab until the analysis of this measurement is completed. When the analysis of a measurement is completed and reports are ready to be viewed, the measurement is displayed under the 'Analysis completed' tab. Click on a measurement to view or download the reports. All reports for which you have purchased a license are visible here. When the software fails to analyse a measurement it will be displayed under the 'Analysis failed' tab'. The McRoberts Support Team will be notified of such an analysis failure and will fix the problem or otherwise contact you. Any measurement that's not in any of the categories above is considered "idle" and will be shown here. This is usually because you don't have the appropriate licenses to start analysis. Contact McRoberts if you wish to take further actions. Measurements can also be viewed per project. 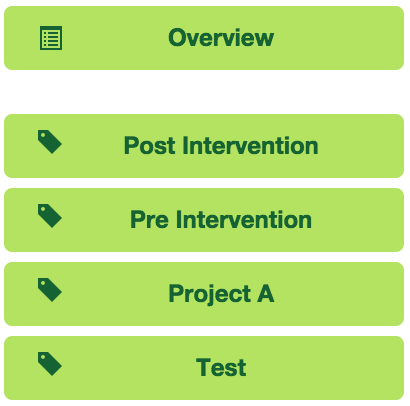 All your projects are displayed below the 'overview' button on the left-hand side of the screen. A project can be shared with colleagues. To do this, click on the button 'shared users', fill in an email address and assign 'permissions' to him or her for this project. Make sure that the colleague that you add already has a My McRoberts account; the email address must be recognised by My McRoberts. The first 4 permissions refer to the data. By making someone 'Admin' he or she has the rights to add people to and withdraw people from the project.